This cozy log cabin nestled in the tall pines is the perfect mountain retreat. 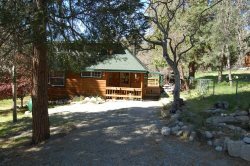 It's located at the end of a private country lane right in the heart of Idyllwild (just a short 10 minute stroll to the village center). So imagine this...sitting high up on the tranquil covered deck drinking a coffee in the morning surrounded by trees. The way the cabin is situated it truly feels secluded. Inside the large rock fireplace crackles in the high beamed ceiling living room. The big comfy sleeper sofa with lounger is the perfect veg out spot to watch the Smart HDTV complete with Netflix, and a DVD. The cozy kitchen has a large dining table for the rustic dish that's cooking in the retro oven. The large and private loft has a king sized bed and half bath. The second bedroom on the main floor has an oh so comfortable queen-sized bed. There is a complete bath on the main floor and a laundry room with a washer and dryer. Simple rustic charm done right.